Flying planes around is fun, but what is really a skill is putting a scale bomb (Adam Bomb) on target. The whole hobby goes to a new level and I think you will enjoy the Adam Bomb as much as we do. Making bomb runs is fun and exciting. Just don’t fly holes in the sky–put them in the ground too. That is why we created the scale bomb that not only looks real on the plane, but when it hits the ground simulates an explosion. The mechanism works off a separate servo( servo not include) or spare function such as flaps or even the rudder servo if you can get a push rod to reach the mechanism from those servo locations. It only needs to move a small fraction of an inch to release the bomb. 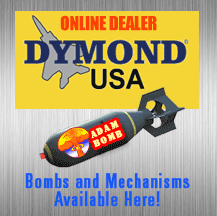 The Adam Bomb currently is distributed by DymondUSA in Monroe, North Carolina and Robbins Hobby in Glendale, California. If you would like to become a stocking dealer, please contact us. We would be eager to talk to you.